A “low church” Episcopalian all his life, Lee received religious training at home. He observed that his mother, who influenced him greatly, was “singularly pious from love to Almighty God and love of virtue.” His father, “Light Horse Harry” Lee, had won fame in the Revolutionary War. At West Point, Lee accomplished a still-legendary feat: he graduated with the highest cadet rank and without a single demerit. After graduation, Lee married Mary Custis, whose piety rivaled his mother’s. They had seven children (all three sons served with high rank in the Confederate Army), and Lee was confirmed with two of his daughters in Christ Church, Alexandria, Virginia, in 1853. Lee served gallantly in the Mexican War and later became superintendent of West Point. After John Brown’s raid at Harper’s Ferry, he led the Marines that stormed and retook the garrison. In 1861, as civil war broke out, Lee was offered chief command of the Union forces. He refused the offer, resigned his commission, and soon became a general for the Confederacy. Though Lee once described the master-slave relationship as “the best that can exist between the black and white races,” he advocated gradual emancipation of slaves. When he received slaves from his father-in-law’s will, in fact, he released them. But Lee would not succumb to the northern abolitionists’ determination to force the issue. Throughout the war, Lee faced overwhelming Union forces. At first criticized as “Granny Lee” in the South, he soon displayed his military brilliance. At times during the war, his casualties were only about one-third of those in opposing units. Lee daily read the Bible and prayed, and these lifelong practices were not greatly altered during the war. Unlike his Union counterpart, General Grant, he was noted for self-denial and self-control. He disliked tobacco, hated whiskey, and drank wine only in small quantities on rare occasions. Following the Confederates’ defeat, Lee said, “I have fought against the people of the North because I believed they were seeking to wrest from the South its dearest rights. But I have never cherished toward them bitter or vindictive feelings, and I have never seen the day when I did not pray for them.” Lee applied for restoration of his U.S. citizenship, but the application was mislaid. Astoundingly, it was not found and granted until the 1970s. Both in faith and in battle, he would not be moved. Orphaned at age 6, Jackson grew up poor and uneducated in foster homes. He entered West Point near the bottom of his class, but he graduated seventeenth. The second lieutenant then served in the Mexican-American War. 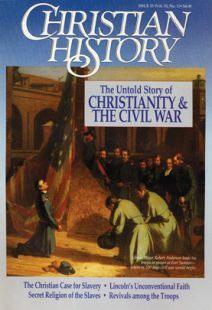 Following the war, while Jackson was in the occupation force, his superior challenged him to study Christianity. He did, all the while struggling with intestinal problems. He wrote his sister that his digestive problems “were decreed by Heaven’s sovereign, as a punishment for my offenses against his Holy Laws and have probably been the instrument of turning me from the path of eternal death, to that of everlasting life.” He was baptized at age 25. Five years later, his young wife and unborn child died, which devastated him but ultimately strengthened his faith. He remarried, and his second wife, Mary Anna Morrison, lived until 1915. Though baptized an Episcopalian, Jackson became a Presbyterian, and he was a noted tither to his home church. The Jackson family held prayers at seven A.M., and even servants were required to attend. Jackson never waited for anyone, not even his wife, to begin prayers. Following breakfast, Jackson would leave for his teaching duties at Virginia Military Institute (where his students called him “Tom Fool Jackson”). Jackson would return home for Bible study, which he did using a commentary. The name stuck, and “Stonewall” Jackson soon became Lee’s right arm in battle. He daringly moved large numbers of men quickly (some say too recklessly). In one sixty-day period, his troops marched over six hundred miles and fought five major battles and numerous skirmishes. Following every victory, Jackson ordered his chaplains to hold thanksgiving services. He was known to ride through the camps distributing tracts to his soldiers, and he often took part in his troops’ religious meetings. Wrote Henry Kyd Douglas in I Rode with Stonewall: “And when he had reached the place of prayer, lo, the camp was there. Bowed heads, bent knees, hats off, silence! Stonewall Jackson was kneeling to the Lord of Hosts, in prayer for his people!” Sundays were generally a day of rest. “Deacon Jackson,” as his men sometimes called him, hated doing battle on Sunday. Because of this, he could declare: “My religious belief teaches me to feel as safe in battle as in bed. God has fixed the time of my death.” After being accidently shot by his own forces, he died on Sunday, May 10, 1863. “I always wanted to die on a Sunday,” he said. After the war, he returned to Grace Church in Lexington. He looked much like Robert E. Lee, and he counted Lee as his close personal friend. Lee served on the vestry of Pendleton’s church. Pendleton spent the remainder of his life helping the poor. Searching for meaning in defeat, he compared the northern occupation forces to the Romans who persecuted the first-century Christians. In his final year at West Point, Leonidas Polk read an evangelical tract and converted to Christ. His conversion and baptism touched off the first revival in West Point’s history. Receiving his military commission in 1827, Polk resigned it six months later in order to enter Virginia Theological Seminary. He later became the first Episcopal bishop of Louisiana. In June 1864 a cannonball struck down the most beloved general in the Army of the Tennessee. Following the war, Howard led the Freedmen’s Bureau, a government effort to assist former slaves. He helped to found a university for blacks in 1867. Named in his honor, Howard University stands today, in The New York Times’s words, as “the largest and most prestigious black research university in America.” The general also stirred controversy when he tried to integrate a church. On his orders, the Sabbath was observed throughout the Union Army. However, devotion to God and popularity with his troops were not enough to make McClellan one of history’s great commanders. He was overcautious; he continually overestimated the Confederates’ strength, and he was slow to attack. Four months after becoming commander-in-chief, he was demoted by Lincoln; eight months after that, he was ordered to yield his army to General Burnside, go home, and wait for orders. They never came. In 1864, McClellan ran against Lincoln as the Democratic candidate for president. Early on, it looked like he might win, but Union military victories boosted support for Lincoln, and McClellan carried only three states. Later, he served as governor of New Jersey. The passionate Catholic wouldn’t fight on Sundays. After maneuvering brilliantly in the 1863 Tullahoma Campaign in Tennessee, Rosecrans’s forces suffered brutal losses at Chickamauga, “the River of Death.” Some 35,000 men fell on both sides in two days’ fighting, and the heavy losses effectively ended Rosecrans’s military career. Dr. Jeffery Warren Scott is pastor of Broadman Baptist Church in Cuyahoga Falls, Ohio. Mary Ann Jeffreys is editorial coordinator of Christian History.